This guide will cover the question you’re probably wondering What is ClickFunnels? So if you run a business and are curious about landing pages and building funnels to generate leads and sales, you’re in the right place! What is a funnel hack? ClickFunnels is a cloud-based software platform that allows you to set up a series of web pages referred to as funnels. 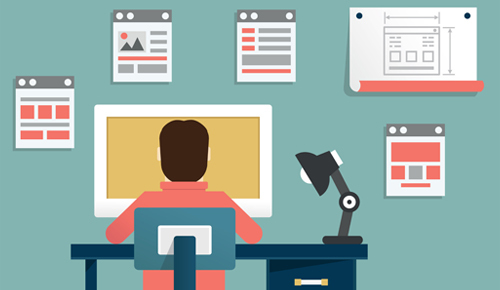 The web pages are specifically designed to get website visitors to take action. So whether you want visitors to purchase a product or just enter their email address to receive something, you’re converting traffic at a much higher rate than a standard website. And they will quite possibly never come back! So how do you fix this, you ask? Well if you create very simple pages that provide just enough information to the end user and then include a VERY specific action that you want them to take, the chances of them completing that action are VERY high! You can even line up several actions that you want the user to take, this is what is referred to as a funnel. With ClickFunnels you can easily create all different types of funnels no matter what type of business you run. Better than that, you can also share funnels with others. So you don't even have to start from scratch because most high converting funnels are available around the web for free. Even if you did start from scratch with building your own landing page or funnel, ClickFunnels is completely drag and drop so you really don't need to have any design skills at all. You just click and drap everything onto the screen until your heart's content! I have clients with little to zero experience with website design and they are up and running with ClickFunnels in less than an hour. You can either build your entire website with ClickFunnels or you can just use it for your paid traffic and specific campaigns. A good example is if you’re running Facebook ads to receive a free PDF guide. Rather than sending that traffic to your website and hoping people do not get distracted by everything else going on, you can build a specific landing page that captures their attention and provides a form for them to get their PDF immediately if they just enter their email address! To take it step further ClickFunnels can also handle all of the follow emails which are referring to as a follow up sequence or drip campaign. So you setup a series of emails that go out after the user submits their information on your landing page. Then the next day another email will go out maybe promoting another over or providing some value. Each day after that another email will continue to go out providing value and building a relationship with your audience, on auto-pilot! How do you not get excited about that? It’s like building an engine and then all you need to do from here forward is add fuel to it (traffic). As that traffic visits the page, a percentage will convert, get your free PDF and then get follow-up emails from you each day for one week! Now this is just an example but I hope you see the value in how a funnel or landing page can help your business build an audience very quickly! How much is this all going to set me back? What will ClickFunnels cost me? If something costs $1,000 but it brings in $50,000 a year, would you buy it? Um, you better! So when it comes to ClickFunnels, you really need to think about it in terms of return on investment (ROI). It’s not an accident that all of these people have pulled in over 1 million dollars on ClickFunnels! 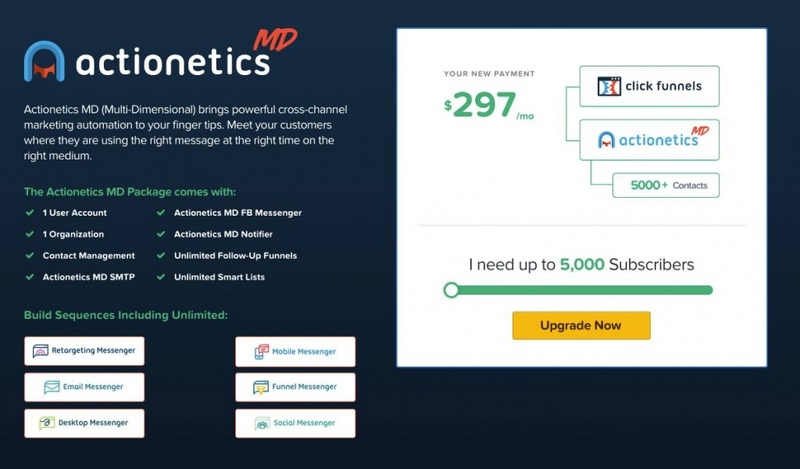 Actionetics essentially lets you scrap your email service provider and use ClickFunnels to create a follow-up sequence that will go out to all leads that enter their info into one of your lead capture pages or funnels. With Actionetics, not only can you send email but you can also schedule text messages to go out to your leads automatically as well. Last but not least, Actionetics also offer a lead scoring feature that will help you understand how much each of your leads is worth to you by giving you a real-time snapshot of each lead that enters into your ClickFunnels account. This is truly one of the amazing features that make ClickFunnels so different than any of the competitors out there. This is one of the best solutions imaginable for not only capturing leads but nurturing and presenting new offers is also a breeze! If you want Actionetics you will need to subscribe to the Full Suite you can get a free 14-day trial. Just released on March 22, 2018, Actionetics MD (Multi-Dimensional) brings cross-channel marketing automation to your fingertips. Now, you can meet your customers where they are using the right message at the right time and medium! If you just started looking into ClickFunnels or if you are stuck and need some ideas on what some high converting funnels look like, I have created a list below with links so that you can download each of them into your own account - for FREE! #1 is our basic lead gen funnel, this funnel is perfect for most businesses that just want to offer a lead magnet in exchange for name and email. Just edit the text and hit publish, it’s that easy! With this funnel real estate agents can direct traffic from sources like Facebook Ads or Google Adwords and target people interested in buying a home in their target area. This real estate funnel has two steps. In the first step, we collect minimal info in exchange for a list of homes for sale. On step two of the funnel we asl the lead if they are also interested in receiving a PDF “Tips for increasing the Value of Your Home Before Selling”. What this does is let us know if they are also a seller lead as well. So with one funnel you can capture buyer and seller leads. The third step is a “Thank you” page where you can direct them to call, email or even link right to a list of hoes for sale in their area. Feel free to use these example funnels from ClickFunnels in your own account or create an account when you go to download funnel of your choice. All new ClickFunnels accounts will get a free 14-day trial, so use one of these example templates and test it out for a couple of weeks to see what you can accomplish. A funnel hack or “Funnel Hacking” is a term used by the ClickFunnels community which refers to the process of dissecting your competitors sales and marketing process and using it as a model to create your own. Ok, let’s say you’re selling fidget spinners on Facebook. You have and ad and then that ad takes me to your landing page, I purchase my cool new spinner but then on the next page I have an offer to get 2 more fidget spinners (as Christmas gifts) for a low price of $10! Heck yes! So I say yes to that and now rather than buying 1 fidget spinner, I just bought 3! This is an example of how you can have upsells and downsells or one-time offers (OTO). So what’s the point and why would I want to funnel hack anyone? Well, let’s say you also sell fidget spinners, you could model your sales flow based off of the competitor above! Especially if you know that he is successful! So the moral of this story is, don't start from scratch. Take ideas from others and model your funnels off what works and what others are doing in the community. From there you can test various layouts, images and CTA’s (call-to-action) to find what works the best for your specific business and your specific offer. Did I tell you that ClickFunnels has a fantastic tool for allowing you to A/B test various landing pages and steps within your funnel? Well they do, it’s very helpful for working your way to the optimal page layout. You can test different images, colors, backgrounds or copy. But I recommend only testing 1 element at a time. Find a winner and then test something else in another test. Hopefully, by now you know what ClickFunnels is and how you can use it to transform your business. It’s not rocket science, it’s a simple software application that focuses on Russell Brunson's genius ideas about how to market and grow your business. Once others give it a try and join the massive community, everything literally just starts falling into place. We use ClickFunnels for our client campaigns ranging from real estate agents, dentists, gym’s and even medical billing. We have generated thousands of leads for our clients (and ourselves) over the years and I honestly don’t think it would have been possible and we wouldn't be as successful without a tool like ClickFunnels. So if you’re on the fence about what landing page software you want to use or if you will be able to afford the monthly fee, just sign up for the free 14-day trial and see for yourself. Join the facebook community and you will be in love! Everyone is very helpful with questions and support and you might even find partners for joint ventures!